This week I'm sharing another craft made from packing supplies. 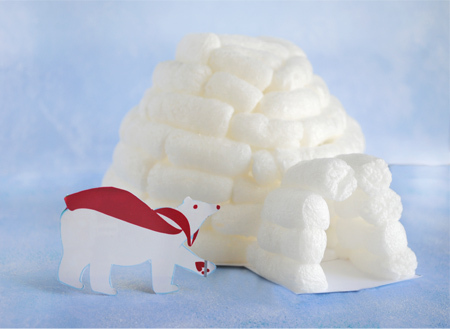 This time I'm making an igloo out of packing peanuts. 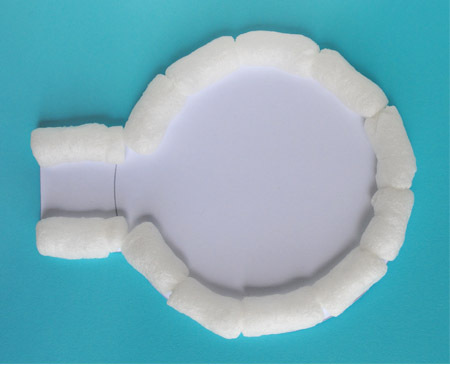 The secret to this project is that the packing peanuts are biodegradable so no glue is required. 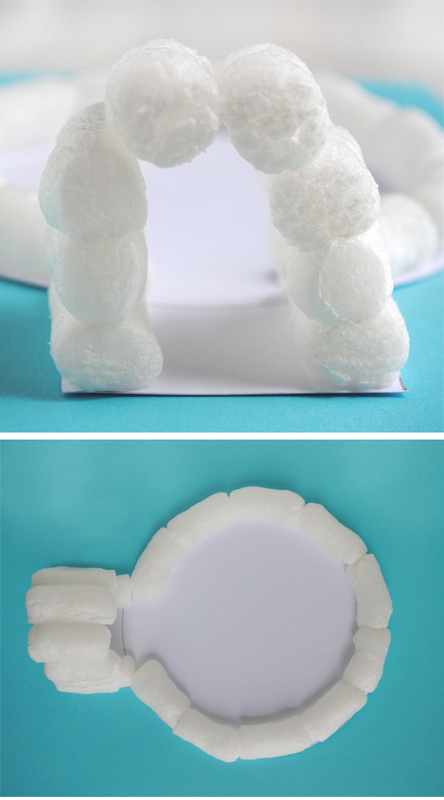 All you need are three things: cardboard, water, and water soluble packing peanuts. 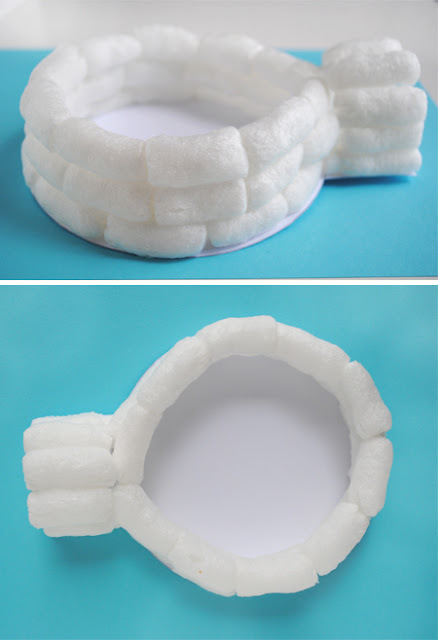 To make the base for your igloo, trace a 5.5 inch circle on cardboard. 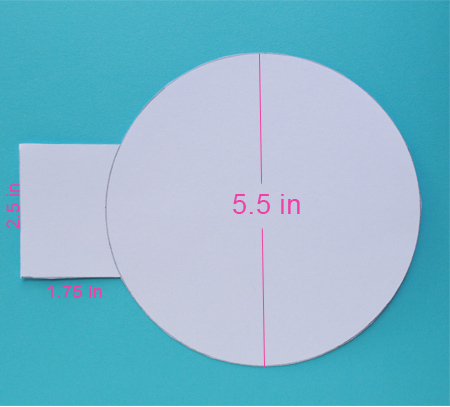 Add a rectangle to the circle according to the measurements above. Cut out your base. 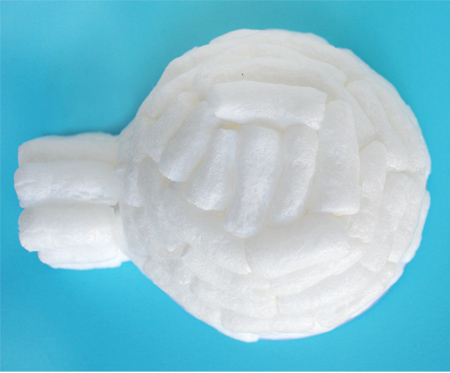 Dip the packing peanuts in water and adhere them to the base as pictured above. The water will make the peanuts sticky. Only get the side of the peanut wet that's going to stick to something, just like you would with glue. *I like to soak a folded paper towel in water and place it on a plate. Then I pat the packing peanuts on the paper towel to get them moist. Just make sure not to get them too wet or they will start to disintegrate. For the opening of the igloo, stack three peanuts on each side directly on top of each other. Then add two peanuts in the center to make an arch shape. Refer to the pictures above. Now add three more layers directly on top of each other around the circle. In the picture there's only three layers but there should be four. Now you're going to make the top of the igloo arch. For the next layer line the circle as before but have the peanuts closer to the inside of the circle. Do this with two more layers. For the top, add as many peanuts as you need to fill the hole. From the picture above, you can see that I used three. You can also cut the peanuts with scissors if you need them to be smaller. It's hard to see in the photo but I added a little glitter to the igloo for some extra sparkle. The polar bear came from a piece of junk mail. That is so cute and clever! Thanks for sharing!! Heeee! What a hilarious and adorable idea! That is adorable. Darn, I just threw away some peanuts. I will definitely save the next ones. I saw a cute polar bear ornament at Target that would have been perfect for it. This is such a clever idea! I'm definitely going to do this if we get any peanuts with the online orders. Now THAT is cute! What a smart idea. I hate throwing those out, even if they do dissolve :). You know, I've always wondered how many people actually take the time to dissolve them or even know they can dissolve. Your loved ones create one small heaven on earth for you, and just a treasured gift is enough to bring a smile on their face. Visit www.rightflorist.com/Netherlands_Florist/Gifts_Flowers_Netherlands.asp for more info. This is such a great idea!! Gotta love giving packing peanuts a second chance!! Just posted on Craft Gossip! I like your idea of this recycle craft. I especially like how to use the blue background for the photos. to it. Only exclusive christmas jewelry can it give you this feeling. And the beautiful but affortable bracelet for girl and the jewelry accessories would make you wedding more lasting. 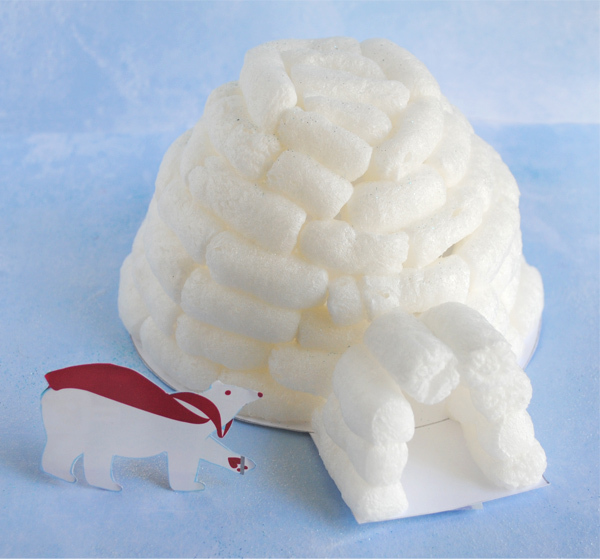 I just love the igloo it is so adorable i have been searching the web for an igloo,and came across your site can u tell me around about how many peanuts did u use.I am on my way to the store to get some. The one in the picture took 79 packing peanuts.